A preview of the lavish costumes in the Gothic creeper “Crimson Peak,” starring Mia Wasikowska and Tom Hiddleston. This is what I look like when I go downstairs for a glass of water in the middle of the night — in my dreams, that is. 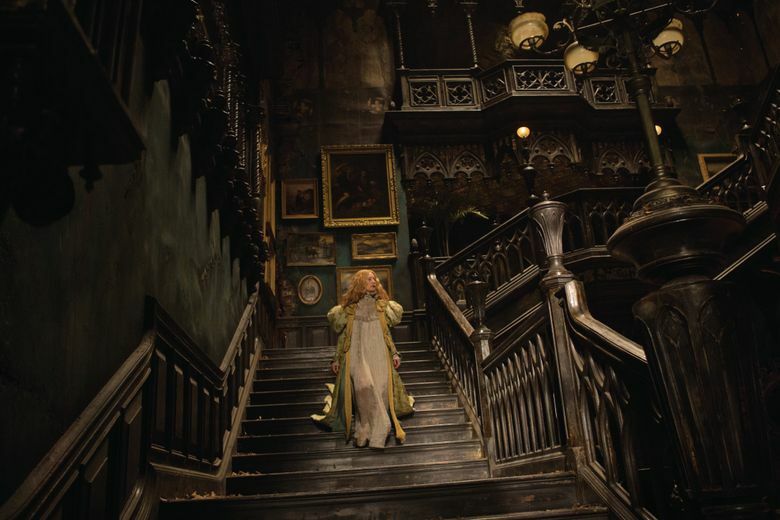 Actually it’s Mia Wasikowska in Guillermo del Toro’s upcoming Gothic romance “Crimson Peak,” which also stars Jessica Chastain and Tom Hiddleston and opens in theaters Oct. 16. I can’t resist a lavish costume pic, and this one, designed by Kate Hawley and set in an old house in upstate New York in 1901 where Strange Things Are Afoot, should fit the bill. Just look at the sleeves on that dressing gown; she could be carrying kittens in there. And probably should.